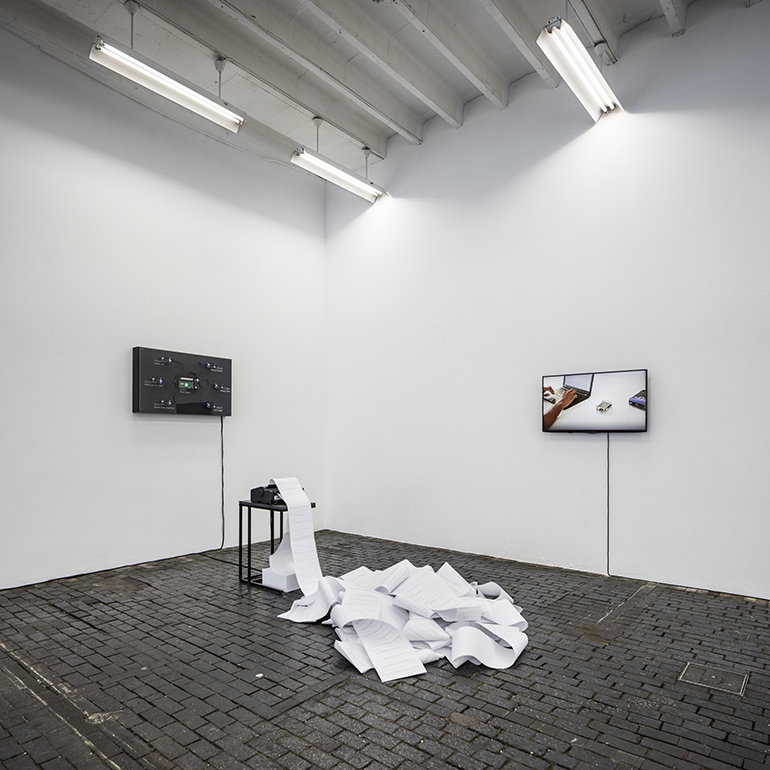 Software, BeagleBones Black, switch, dot matrix printer, listing paper, MDF, acrylic. Masquerade is part of the Espace Multimédia Gantner’s collection. In 2013, Edward Snowden disclosed several classified documents, revealing surveillance programs run by the National Security Agency of the USA. In 2015, despite the NSA controversy, the French National Assembly adopted a law about global surveillance proposed by the government. This law legalizes the use of black boxes on the network, filtering all the traffic and looking for suspicious behaviors. Worldwide, surveillance techniques such as Deep Packet Inspection (DPI) are used. DPI examines the data part of a network packet, searching for protocol non-compliance, viruses, spam, intrusions, or any other defined criteria to filter it. This technique has been used by the NSA and during the Arab Spring among others. I consider that such practices are a violation of our privacy. 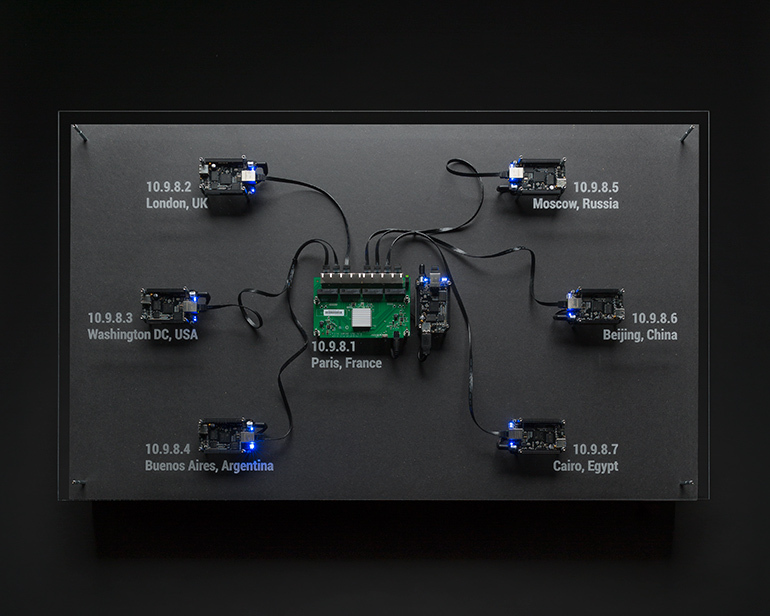 Thus, I created Masquerade : a tool for citizens who want to protest against mass surveillance. Masquerade is based on obfuscation : a strategy that consists in publishing amount of incorrect data to protect privacy. When it’s plugged to the Internet, the masq box generates small suspicious messages based on alleged trigger words and sends them to other masqs. In large numbers, those messages create a constant noise on the network in order to disrupt mass surveillance. No two generated messages are alike, in this way it can’t be spotted as a bot. Masquerade doesn’t break any actual law, it just sends simple messages as you do when you chat online. The project will soon be released under an open source licence. There is no way to measure the efficiency of Masquerade, but we can hope that its use brings a public discussion on mass surveillance issues. Masquerade is a design proposal that goes beyond individual camouflage and relies on a collective effort. It is intended for any citizen worried about seeing his Right to Privacy violated by his own government or any foreign government. « Privacy is necessary for an open society in the electronic age. Privacy is not secrecy. A private matter is something one doesn’t want the whole world to know, but a secret matter is something one doesn’t want anybody to know. Privacy is the power to selectively reveal oneself to the world. » – A Cypherpunk’s Manifesto, Eric Hughes, 1993. « No one shall be subjected to arbitrary interference with his privacy, family, home or correspondence, nor to attacks upon his honour and reputation. Everyone has the right to the protection of the law against such interference or attacks. » – Art. 12, Universal Declaration of Human Rights, 1948. To make it understandable in an exhibition context, Masquerade is presented as an installation. This installation works locally (it’s not connected to the Internet). 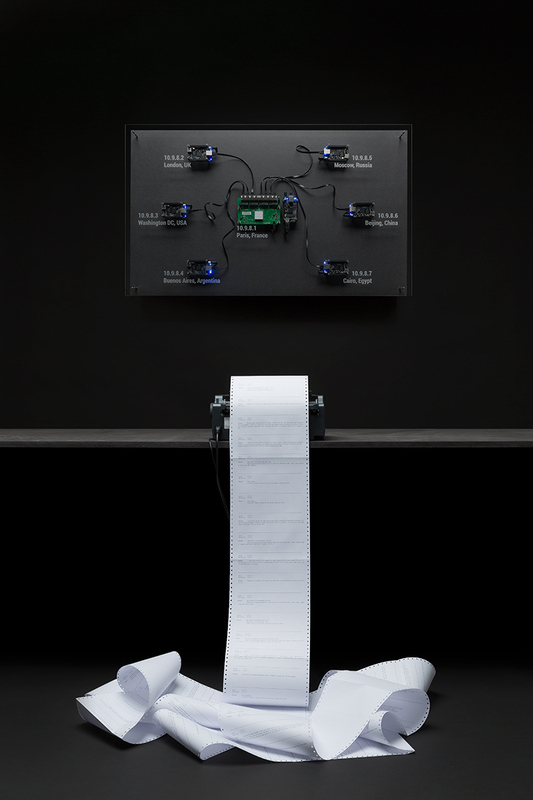 A network of multiple masqs is shown and works as it would online: the boxes send small suspicious message between them; a central server handles and prints the messages through a dot-matrix printer on continuous paper, the accumulation of printed messages shows the amount of data created by the system. Thanks to Julian Oliver for his initial support.